hello friends! i’m so excited to be back in my blogging chair and writing about one of my favorite knitspot projects—our annual red scarf scholarship fundraiser. funding our scholarship has become a warm and inspiring tradition in our community, one that knits us together across the miles. i feel like it commemorates the fast and solid friendships we’ve nurtured through our years of knitting, chatting, clubbing, confessing, and laughing together here at the knitspot. it’s our chance to share the good fortune and support we’ve enjoyed, passing it on to an aspiring young person who is becoming a success on their own. plus, it involves RED YARN—what’s not to love? for those who are new to this, let’s start with the specifics. our scholarship is offered each year to one student (studying in a field related to our industry whenever possibly) participating in the foster care to success (FC2S) program for kids who have aged out of the foster care system and who aspire to continue their education. the fund provides and administers scholarships, life guidance, and help with handling the challenges of higher education. this is jelissa roberts, our current scholarship recipient. 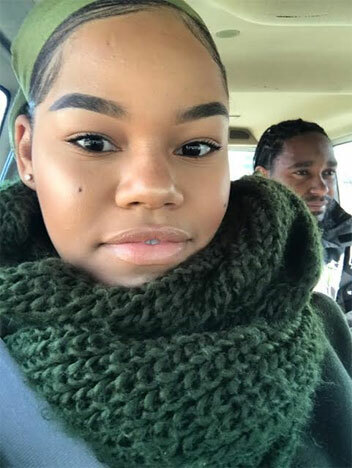 she’s is a fashion business major at FIT in NYC and will graduate in may, thanks to her scholarship. the red scarf fund was created through the knitting community to support FC2S students with emergency money for costs not covered by tuition and scholarships; the red scarf project is a way for knitters to contribute warming gifts and care packages to hardworking students as a special valentine’s treat. 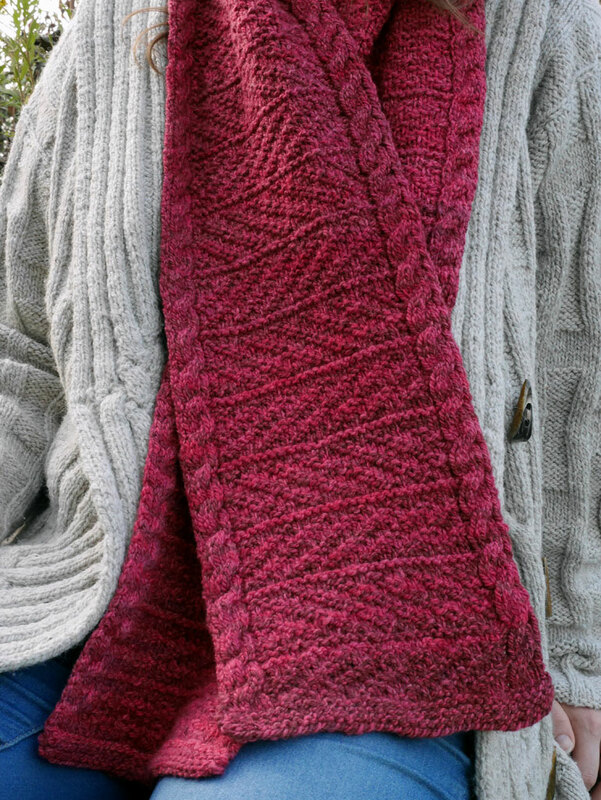 the knitspot scholarship has its origins in the red scarf project—as i participated each year, i had the idea to publish a pattern to raise money for the care package postage fund. this effort grew and became SO popular, that within a few years, it was earning enough to fund a separate knitspot community scholarship. 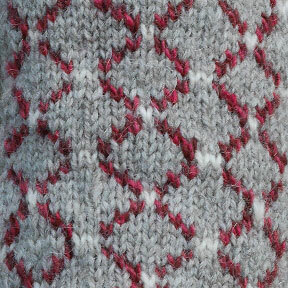 you can see all of our red scarf patterns, past and present in our online shop. this year, in an effort to exceed all previous funding efforts, we are ginning up the fun factor with yet another new twist—MORE DESIGNERS AND PATTERNS! 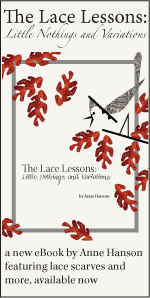 i am very please to announce that THIS year i am joined by the talented and generous Kerri Blumer, Kate Atherley, and Mary O’Shea in bringing you some red letter pattern choices for the holiday season. we’ve put together a crackerjack portfolio of people pleasing textures and color for quick, fun, last-minute gift knits as well as those to invest with love. the entire price of each and every pattern with be placed in the scholarship fund. 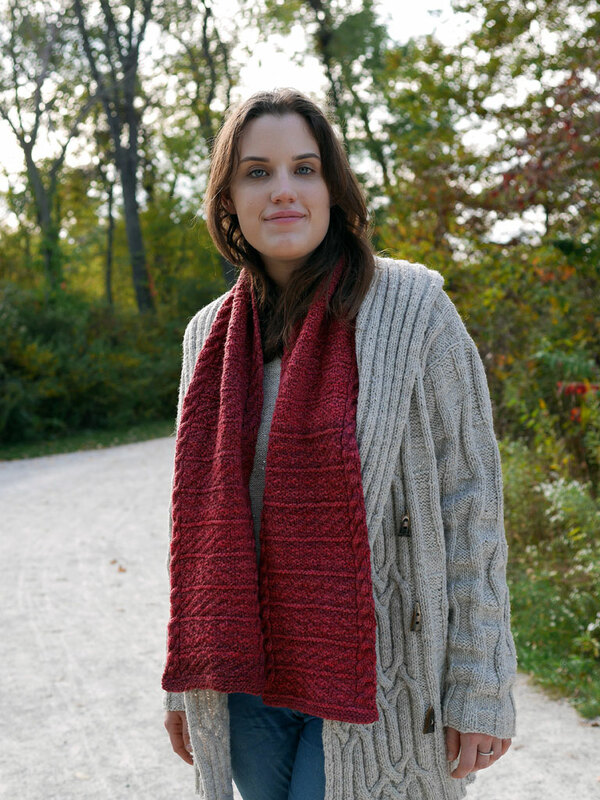 the first patterns are this gorgeous andiron scarf and andiron cowl designed by kerri blumer—read on for more purchasing details and kit options! a few years ago, we started offering a special red yarn to go with the annual scarf design, for which we also donate a percentage. we call it festivus and it’s offered as a one-time, seasonal batch that is not repeated; when it’s gone it’s gone! what began as a mill accident has evolved into a MUCH anticipated competitive dash to acquire at least one skein—festivus usually disappears quickly, never to be seen again. 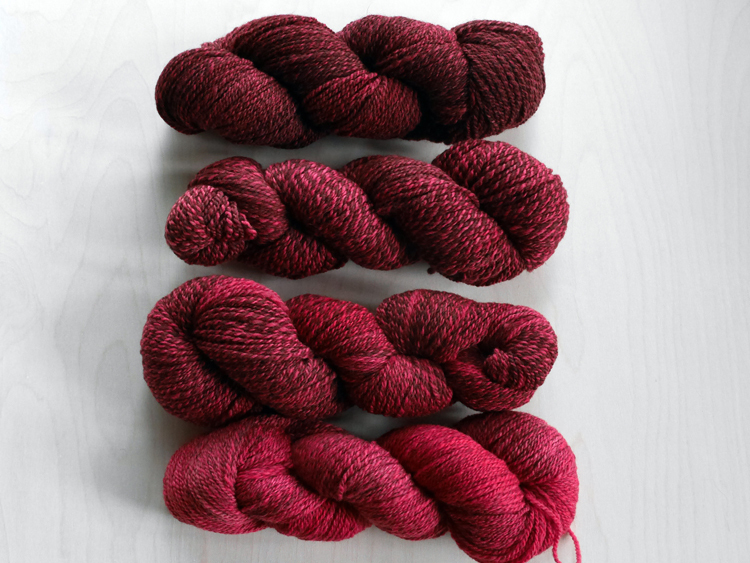 our 2017 festivus 4.0 yarn is dyed on our new patchwork gradient base by the very popular julie asselin, in her custom-for-us cranberry crush colorway. available in both festivus 4.0 worsted and festivus 4.0 sport weights, this cushy 2-ply yarn, is spun in 100 percent merino from varying shades of natural wool, which produces a slow-fade gradient fabric and subtle striping. 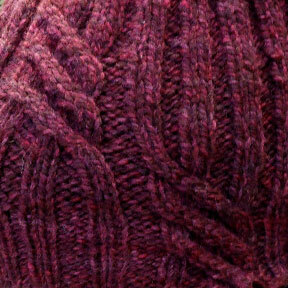 the shading in each skein is completely random; every one is a unique work of art. 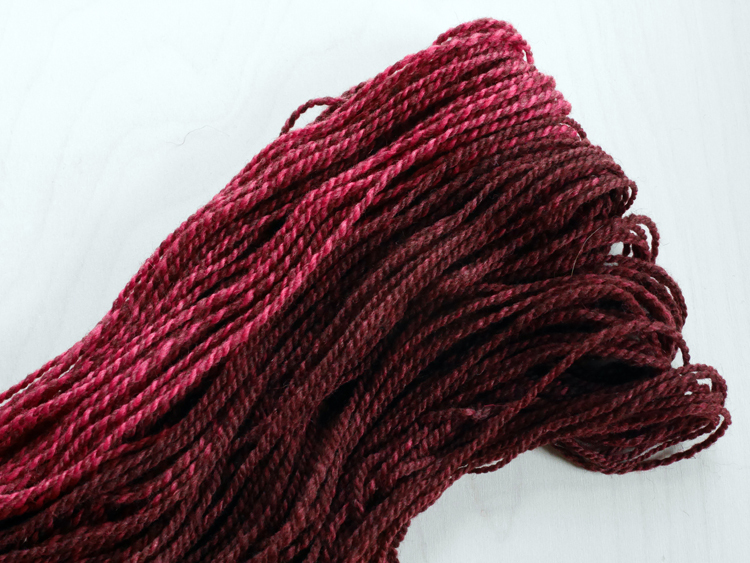 this year’s yarn reminds me of red glass tree ornaments; they catch the light in such a variety of shades. we are making all the festivus that we ordered available NOW; we know everyone looks forward to getting some as soon as it it’s available. we’ll keep the fun going by offering the patterns on a continual rollout—every week or two another option will be presented to keep your fingers happily working in that gorgeous festivus yarn. 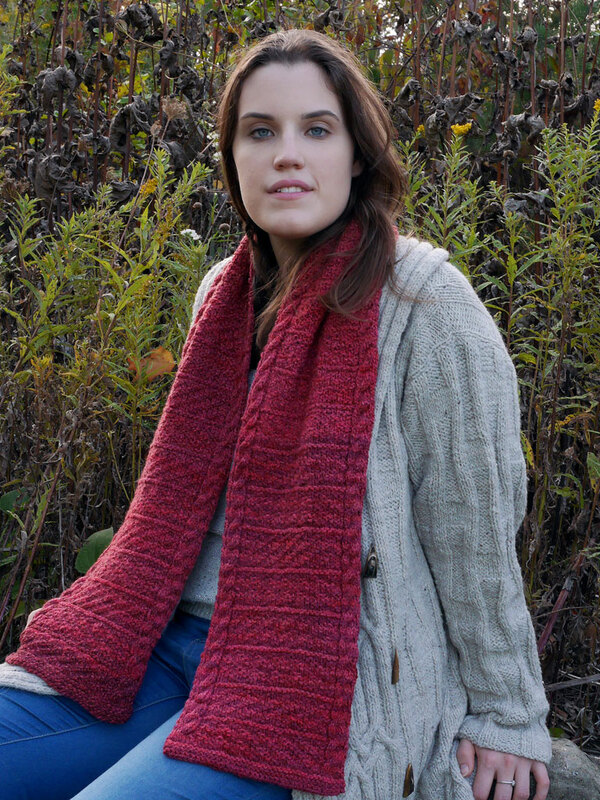 this is a nice, long scarf as shown, but as with any scarf the length is up to you and easily adjusted. 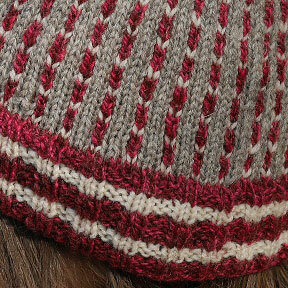 the pattern is a soothing repetition of knit/purl texture, bordered by a simple cable at the edges. its horizontal orientation makes the most of the slow-fade gradient yarn, resulting in subtle color transitions, even in a narrow piece. a super-squishy muffler for the coldest winter days and sure to be appealing to women and men alike. to view more information or purchase a scarf pattern, please click here for our store listing, where you can also choose to add a donation using the pulldown menu; we will be happy to add it to your ravelry library afterward if you request it. 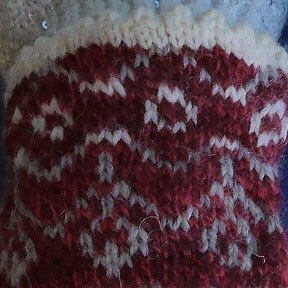 OR click here to purchase on ravelry (no extra donation option). 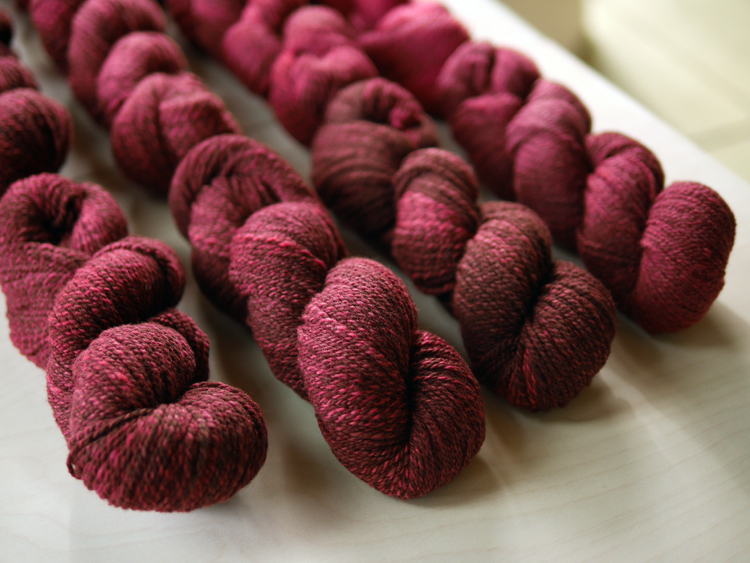 and we have kits all made up for you in festivus 4.0 merino 2-ply gradient. the kit includes the yarn and pattern, plus you may add a donation if you choose. a percentage of the yarn price PLUS the entire pattern price (and donation) will be added to the scholarship fund. 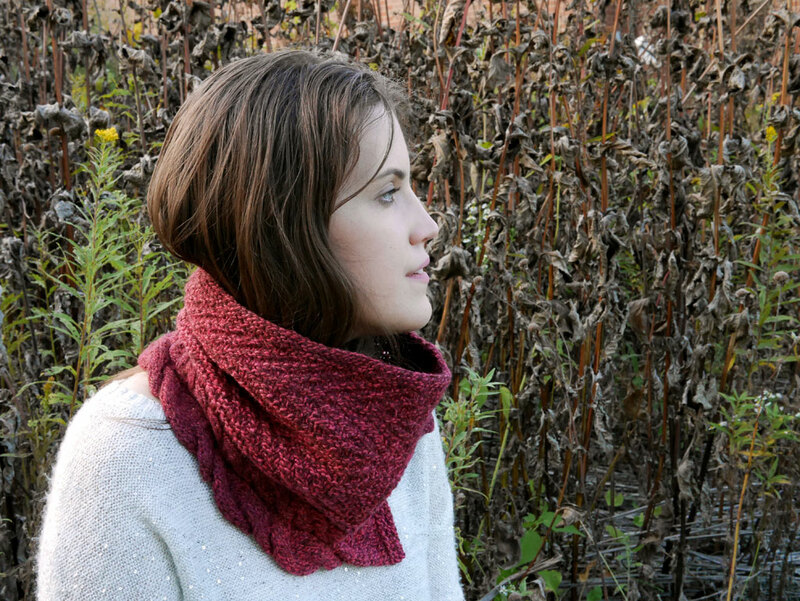 the andiron cowl has the same handsome texture as the scarf. here, the cable feature along the edge takes on the appearance of a ribbon edging. the edging has a split at on side to encourage just the right amount of slouchiness and drape—it covers the open lapel of a coat, but stands tall to shield your face from the wind if needed. 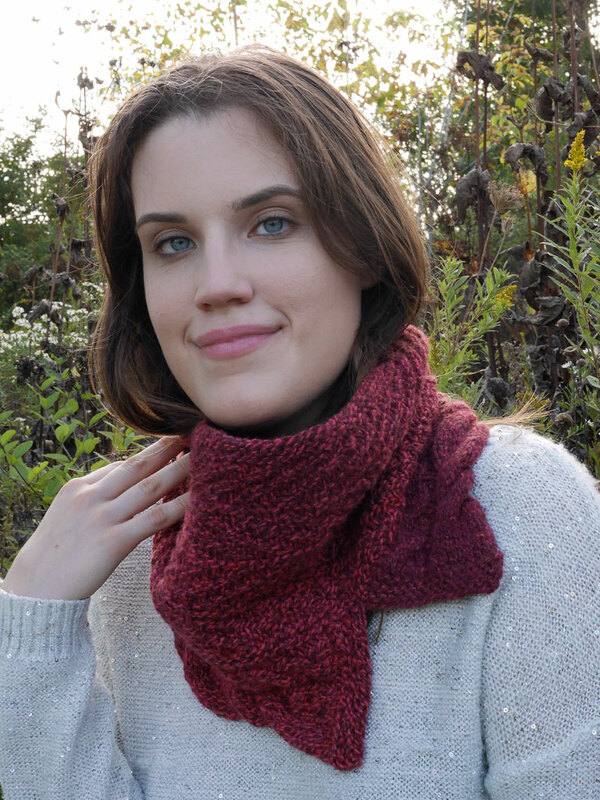 to view more information or purchase a cowl pattern, please click here for our store listing, where you can also choose to add a donation using the pulldown menu; we will be happy to add it to your ravelry library afterward if you request it. 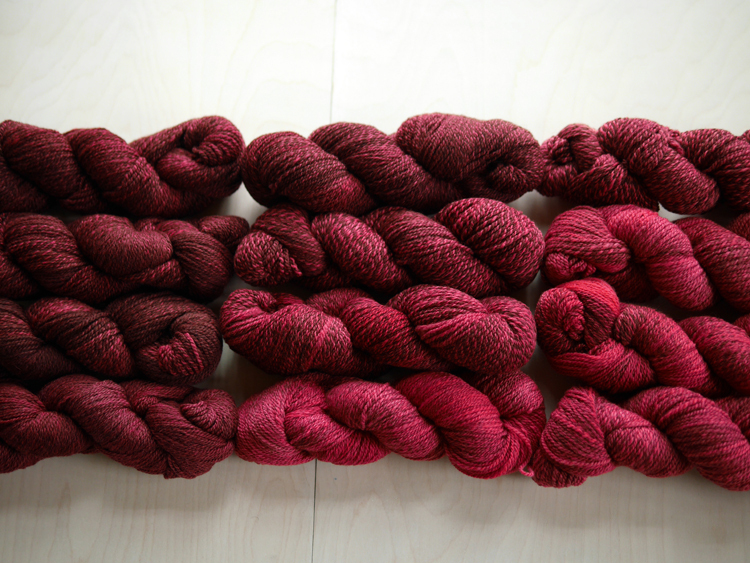 we also have cowl kits all made up for you in festivus 4.0 merino 2-ply gradient. the kit includes the yarn and pattern, plus you may add a donation if you choose. a percentage of the yarn price PLUS the entire pattern price (and donation) will be added to the scholarship fund. i would like to thank kerri so very much for designing these pieces for the scholarship fundraiser; she’s just awesome and she has lots of beautiful designs to share—be sure to check out her ravelry shop. want a lil peek at some of what we have in store for you from our other designer contributors? lots of clever detail, schmooshy texture, and FUN to come! now, let’s talk about goals . . . last year we set a goal of $5000 but unfortunately did not meet it, falling rather short. i would love, love, LOVE to make it up this year and top the charts with the best fundraiser ever. let’s try to exceed last year’s goal of $5000—can we get to $6000 this year?? 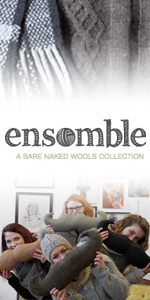 purchase a pattern on ravelry—the entire retail pattern price will go into the scholarship fund. purchase a nifty scarf or cowl kit which includes the pattern PLUS enough special edition festivus 4.0, to knit a scarf or cowl. we will add 5% of your yarn purchase price to the fund. please, please, PLEASE tell everyone you know about the fundraiser—they don’t need to be a knitter to throw $6 or $7 (or more!!) at this wonderful cause. please mention it with a link and hashtag on your Instagram, Facebook page (and link it), tweet it (with a link! ), pin it (yes, with link) and finally just drag your friends over to look at the blog, haha. we’ll even give them a “knitter for a day badge” if they help out. 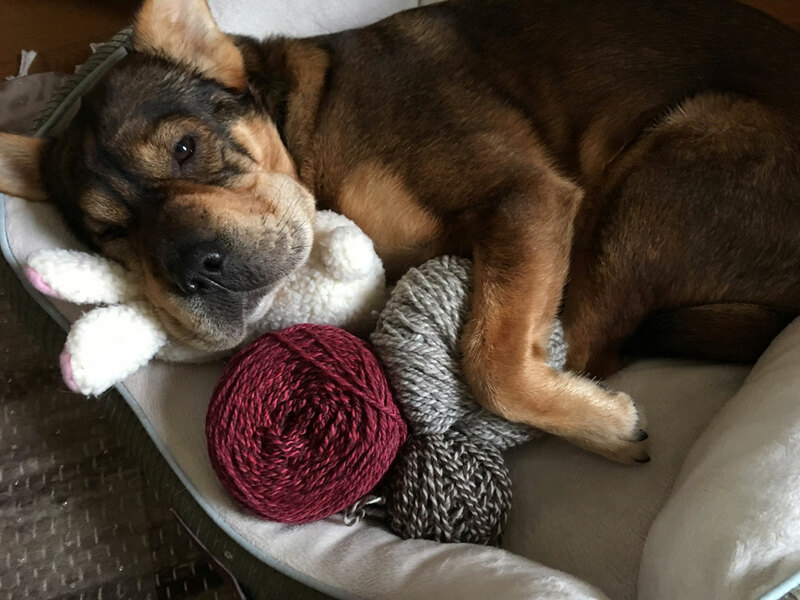 cardigan is a HUGE fan of this fundraising project by the way—as a former street dog, she knows all too well how tough it is out there on one’s own. you have to have to be smart and have guardian angels or be incredibly charming to snag a good gig. so she’s completely on board with what we’re doing. hmmm, red or natural?? 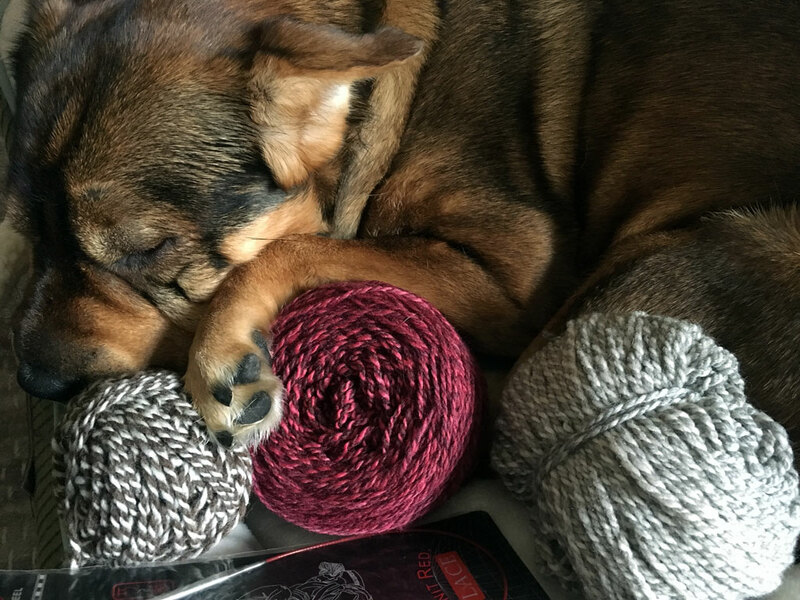 cardigan has been sniffing to decide which she prefers, but it’s a tough decision; she might have to knit a project in each one. and with that, i’m going to sign off and go work on my own design contribution to the cause—secret for now, but i think you’ll like it. oh, i guess cardigan decided she likes ALL the yarn and wants to keep it. she’s swatching now to figure out which to knit with first . . . and after that, scarf or cowl? or maybe she needs a blanket more. thank you all so much in advance; let’s make 2017 our biggest year yet! Yay a blog post! I have missed them. I ordered a cowl kit this afternoon with an extra donation tacked on . But I see from your sneak peaks of the other designers that I will want to donate again, and maybe again. I looked at the yarn then the pattern and thought “why is there sport yarn?” forgetting that there would be several designers/patterns coming along. Cardigan hello!!!! (Waving) Have missed you, hope you are staying out of trouble! You’re looking mighty fine and comfy! So good to see a new blog post and Cardigan’s happy face. And it’s so exciting to have multiple Red Scarf patterns this year. So happy to have a blog post from you…have missed them terribly! Great project, great program! Yay, got my scarf kit & always happy to help with education! Yay! I’m so happy to see a blog post! 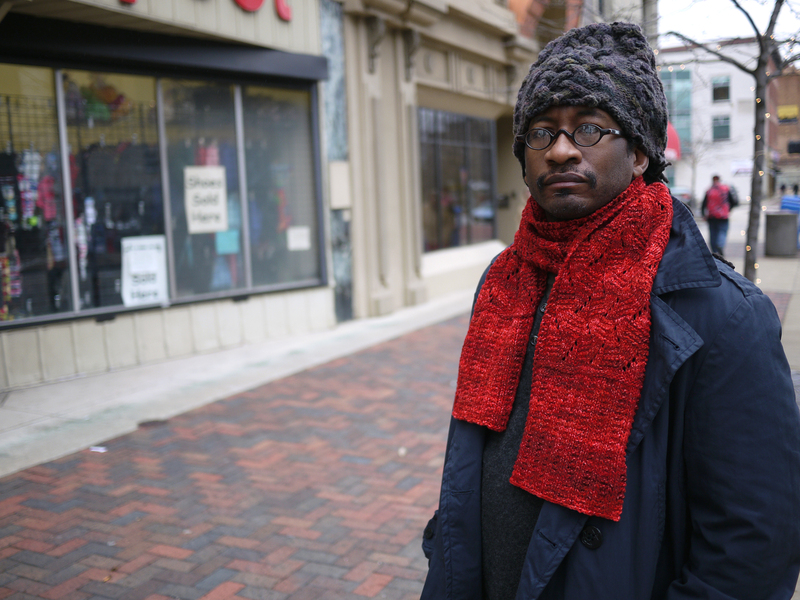 I eagerly anticipate the Red Scarf project every year. I just added two skeins of Festivus 4.0 to my stash, the color is AMAZING. Just a heads up… the links to the patterns up top (with the photos) work fine, but the first two pattern only links in your list at the bottom (how you can help…) are sending me to last years Snow Flies. I’m buying through Ravelry, and making a donation separately, but like Carrie I suspect I’ll be back for more as the other patterns come out!